Lori's Happy Place: WOYWW?? Do you know what that means? I do. Hi Lori! 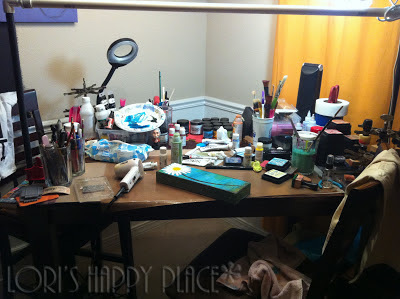 Your desk looks wonderful with all the paints and brushes. And so does the canvas you´re working with. Welcome, Welcome, Welcome to the desk hop. If you are a friend of Sandees then you are a friend of ours. I loooooovvvvvveee your canvas and the colours used perfect. Welcome again and I look forward to seeing what you put on that canvas. Welcome alone, and thanks for the comment, and follow - I will repay the honour. Love your desk, too. I don't do tidy (you will see next week no doubt!) so don't clean up before posting - that's the fun of this!! Hi Lori and welcome to WOYWW. I've been doing this for a couple of years now and this week am visiting all the desks where the number on Julia's list ends with the same as mine (I'm 51) that way I get to see some new (to me) blogs. Thank goodness I did and found yours - beautiful canvas. Haven't visited Sandee's yet this week, just starting my tour now. Nice to meet you Lori, it's always good to see someone new on WOYWW and a friend of Sandees is especially good. Love the look of your desk and look forward to seeing some of your Rtwork. Messy is good, the messier the better. we want to see real crafting going on, so no need t clean - unless you need the space to make even more mess! Enjoy WOYWW - it's the most fun, every week! Thank you for dropping by, any friend of Sandee is welcome here. Be warned though, WOYWW is addictive! But I have been privileged to meet such generous, awesome and downright talented folks. You see such wonderful creations, it fair takes your breath away sometimes...as do some of the desks!!! LOL Yours is tidy by comparison, but we need to see it, warts and all. Mine always seems quite bare, but that's because I need to keep the desk clear for cutting out fabric, so I've learned to be tidy! I love your use of plumbing pipe over your desk for overhead lights! That's the kind of solution my husband would come up with! That's a great "warts and all" desk, nothing to be ashamed of, more for us to look at frankly! Love the canvas it's so happy looking, I would put "SMILE" on it cause that's what I did when I saw it. Hi Lori, and a warm welcome to WOYWW (how's that for alliteration lol!!) - warning (another W!) it's highly addictive... Your desk is wonderful, dirty paint water and all. Dirty paint water is definitely in the spirit of WOYWW! Your canvas looks beautiful and the only word I can think of is "Welcome"! Thank you for visiting my blog. Zentangles are such fun, aren't they. My album is coming along nicely, and soon I shall decorate the cover. Hi Lori from Lancashire in the UK. Thank you for popping over to my blog, I'm glad you enjoyed it. I'm impressed with your flower canvas and I'm looking forward to having a browse round your blog. How about 'If friends were flowers, I'd pick you' ? You will get used to taking photos of a mess or nothing at all! Sometimes I take a picture of an empty table, sometimes with a note on it but I like to take part. Maybe try googling poems about daisies..? Words are not my thing!! Hey Lori, welcome to WOYWW! You'll become addicted like the rest of us, I'm sure... That's a great looking canvas, and I'm sure the right words will come to you - I often leave a project sitting in my eyeline so that it can tell me what comes next! Thanks so much for your visit and happy WOYWW! Your desk has definitely been in the throes of creativity! LOL! Love the used baby wipes! And welcome to WOYWW and thanks for visiting my space. I'll be checking out your blog some more! Hi Lori! welcome to WOYWW and thanks so much for the snoop. You'll love the people on Julia's great blog. Super desk you've got and we like to see it exactly as it is! People who don't make a mess, don't make anything. I tell everyone that I'm clean enough to be healthy and dirty enough to be happy!!! "A Weed is an Educated Flower"
Welcome to the group....dont worry about mess...most of us are terrible! Hi Lori - welcome to WOYWW and thank you for stopping by my blog. I can understand what you mean about it being hard to "bare all" - showing off your messy desk is a little bit like being caught with your pants down! My word offering, as it's your first WOYWW, is "Beginning".... Enjoy your bloghop! lovely to meet you, lori, and welcome to WOYWW! Hi girl and welcome to WOYWW...It is so nice to see your desk and have you visit mine! I love all the bottles of color on your desk. The box you are working on is gorgeous! Hey Lori, thanks for stopping by my blog and for the lovely comments. I think your WOYWW pic is great - it shows how hard you have been working. Welcome to the wonderful world of WOYWW, Lori, you'll be addicted now. Well done for sharing your desk and resisting the temptation to tidy it. We love mess here. It shows creativity is happening and it certainly is judging by that lovely looking canvas. Welcome to WOYWW. Now you've started you won't want to miss a week! We love your canvas. Thanks fr visiting the bears this week. welcome to the crazy addictive world of WOYWW. thanks for following me i have done the same I lookf fporward to seeing what you make each week. Hi Lori!! Welcome to WOYWW! I enjoyed visiting your workdesk, I love your canvas! I am going to try the studio paints one of these days!! Thanks for stopping by my blog! It usually takes me a whole week to visit eveyone! Great canvas (loved the With My Whole Heart post as well). I leave dirty water on my desk all the time. I consider it a success if I remember to put the brush in the water....It looks good to me. Welcome to WOYWW...it's tons of fun and actually pretty grounding. Appreciate your parting words in your posts!! Have a great week. Hi Lori, welcome to WOYWW. Love your desk and the canvas. The whole point is NOT to tidy, it gives us more to sneak a peek at. Hi Lori Thanks for stopping by my WOYWW .........its my first time round too and unlike you did tidy up a little, love the heart project think I need to get my more messy stuff out when hubby's not around. Welcome to the addictive world of WOYWW - it's fun seeing how others work and what they are up to each week. Your canvas is looking really good - also love the one you did in the post below. Welcome to the WOYWW Family Lori. We like to see your desk with warts and all on there! The messier the better sometimes as you get to see some interesting projects/goodies on there. Welcome Lori and thanks for visiting my blog earlier and also welcome as my latest follower. I do admire and envy people who have artistic capabilities, I cannot draw anything that looks like what it should be lol. Welcome to woyww.. That daisy is so lovely on your desk looks like a lovely project on the go there.. Thanks for the visit to my blog ..
Hi Lori, thanks for stopping by my blog. Your work space is very nice indeedy!! Love the canvas you are working on. Welcome to WOYWW an addicting phenomenom for sure. Hello Lori!!! welcome!!! love love your workspace and your paintings!! I am a new follower here!!! Welcome to WOYWW - your desk looks great. And I LOVE the daisy - like Meg Ryan said in You've Got Mail - daisies are the happiest flowers. Great space! Love your floral canvas. How about a sentiment that says "happy". Your canvas is soo happy! Honey, don't worry about the dirty water and paint, we know all about it LOL! Welcome to WOYWW! Glad you have you! Your desk looks fine to me. Why waste time cleaning up when you just mess it up when you have a new project. Tidy desk, nothong happening. Since I know you through Tracy's WWW on Mondaynight, it was fun to get to see your workspace and what you are currently working on. Tis whole concept sounds fun, you are lucky Sandee included you. Lori, a happy desk is a messy desk. My desk must be VERY happy. Keep your desk happy and see you often. Welcome! Look at you! 69 comments! Are we a welcoming group or what? I still don't get that many comments after a year, but I do get a lot from these dear WOYWWers and how fun for you to be friends with Sandee IRL!! We are happy to have you, Lori. I'd say you are embracing your new word for 2013 by TRUSTing us into your crafting space in it's natural state! That canvas looks really great! Thanks for sharing and joining in on the WOYWW fun! Hi Lori! Welcome to WOYWW! You'll find we're a fun supportive bunch of bloggers who really don't care how messy our desks get! Whenever I've mentioned how embarrassed I am of the pics I post of mine, 10 people come back and remind me that it's not messy...it's just the creative process at work! Have fun desk surfing! Thanks for stopping by!! Happy Belated WOYWW and welcome to this very friendly community. Wow, you have loads of comments! Took me ages to scroll down to the bottom. The only words that come to mind for your canvas are "Every Flower is a Soul Blossoming in Nature" Gerard De Nerval. Go to a site called 'BrainyQuote' - it is so useful. Ali x #40 ps Thank you for following my blog, I will do the same. Well think your have been well and truly welcomed to WOYWW as I am comment number 77! Not sure I have even made that many! but then prob need to skate around a lot faster I take too long at each stop! ... and so agree with Shaz's comment about your mixed media piece down below i love it too.. and not really a mixed media piece person but yours is real quality and a lot of it is not..
Hi, Lori, welcome to WOYWW! Don't worry about the detritus of creativity -- that's part of the "fun" of this -- you feel as if you've pulled a chair up to the table of a friend. It looks like you have a nice sturdy table to work on. While I do love my rolltop desk, sometimes I long for a big flat surface. Wow! You have lots of fun paints and good stuff on desk. I love how the canvas is coming along. It does need a quote down the right side. I think every word in its own block if that makes sense. I'm not sure what quote though. Welcome to WOYWW and thanks for the visit! Wow! You have a ton of comments for your first time out!!! Enjoy WOYWW - it's highly addictive, lol! And lots of people have messy desks, no worries! Your desk just doesn't look that easy at all. What it does look is great. I love the canvass that, quite rightly, take centre stage. Thank you so much for stopping by and letting me know I'm not the only skull lover! Welcome Lori, you're a brave soul to join us in this desk hoping journey! It's a lot of fun though and you meet more great people. Your desk is so neat! I guess everyone is picking strong words this year mine is Patience hmmm is all I will say about the progress LOL! Hi Lori, it's not too messy. I really enjoyed my first day as a WOYWW and you obviously did. Here's to many more. Thanks for leaving a message for me. I hope I will have pics soon. All the best, and enjoy our Wednesday company. Welcome to WOYWW! I loved getting a peek at your desk! It looks wonderful. The canvas is just beautiful! Welcome to the crazy place called WOYWW, but be warned, it is more addictive than any known drug! Your desk looks quite tidy compared to a lot of ours. Happy belated WOYWW! Oh love the canvas! The Earth laughs in flowers came to my mind when I saw it! Your desk isn't messy by any means, I've seen messy, I've been messy that isn't it lol! Angie who can't remember her WOYWW number this week lol! Thanks for dropping by and welcome to WOYWW! It can be quite addictive but Sandee has probably already told you that. Nothing wrong with your desk, looks perfectly ok to me! Did you like my washi tape? I haven't got enough :) yet. Love that stuff! welcome to WOYWW Lori. Lovely to meet you. Thank you for your lovely comment on my blog. Your desk looks nice and you have quiet a few things I don't have. your painting is incredible. You've probably got a quote for it by now, but if you haven't let me know and I'll point you to some great ones. Welcome to WOYWW, Lori! what a wonderful desk of creativity! Don't worry about tidying it up for us, we don't mind the mess at all. Trust us, we all have messy desk one day or another. Thanks for visiting my desk..looking forward to many more..
Daisies always make me think of "Joy". So that's my contribution for word ideas! Thanks for stopping by my desk, and we're so glad you've joined the WOYWW clan! ha, ha do you really think we worry about messy or tidy we are a group of "extreme snoopers" so welcome to WOYWW and enjoy the fun! I was told to behave ( Sandee) so I will try to be good!